﻿ Germany’s Energiewende : The End of Power Market Liberalization? Germany’s Energiewende: The End of Power Market Liberalization? In 2010, Germany’s government defined a bold vision for the country’s energy future, one heavily reliant on renewable-energy sources, distributed generation, and energy efficiency. (See Toward a New Balance of Power: Is Germany Pioneering a Global Transformation of the Energy Sector? BCG report, March 2013.) The government’s plan, spelled out in the Federal Ministry of Economics and Technology’s Energy Concept for an Environmentally Sound, Reliable, and Affordable Energy Supply, set aggressive targets for greenhouse gas emissions (a reduction of 80 percent from 1990 levels by 2050) and energy efficiency (an improvement of 50 percent by 2050). It also committed the country to a full phaseout of nuclear energy by 2022. The plan drew, and continues to draw, strong interest from well beyond Germany’s borders owing to the scope of its ambition and Germany’s prominent role in Europe’s interconnected energy markets. German policy makers in general continue to endorse the Energiewende. This reflects strong public support for the plan’s aims and underlying rationale. Citizens remain firmly committed to renewable energy, with that commitment enhanced by the guaranteed financial returns provided by current policies that make decentralized wind and solar-­photovoltaic (PV) assets attractive investments for many voters. Citizens also remain strongly opposed to nuclear energy; indeed, for German policy makers, support for nuclear energy amounts to political suicide. German citizens also manifest trust in the state, some aversion to big utilities, and a general belief in the value of sustainability. And they express ongoing support for German industry, viewing it as the country’s key economic pillar, as well as support for how the interests of industry are reflected in current policy1. German policy makers are responsive to these views. A number of these considerations, it should be noted, lie outside the classic triangle of energy policy making—sustainability, affordability, and security of supply—making Germany’s policy seem perhaps a bit irrational from a classic policy perspective. Look first at sustainability. Germany’s goal of expanding the role of renewables in its power scheme is very much on track. Renewables accounted for 24 percent of gross electricity consumption in 2013, placing the country slightly above the growth trajectory needed to reach its 2025 target of 40 to 45 percent. But greenhouse gas emissions have recently risen nevertheless. Emissions climbed from 2011 through 2013 owing to a strong increase in coal-based generation, driven by the ongoing phaseout of Germany’s nuclear capacity, a slight recovery in power demand following the 2008 financial crisis, increased power exports (spurred by increasing overcapacity and low domestic wholesale power prices), and low prices for CO2-emissions certificates. In fact, Germany’s power generation from carbon-intense lignite (a type of coal) reached an all-time high in 2013. Germany’s rate of progress to date thus suggests that the country will fall short of its longer-term emissions-reduction targets. Germany’s effort has also had mixed success in terms of affordability. Power prices for German households, at close to 30 eurocents per kilowatt hour (ct/kWh) on average in 2013, are the second highest in Europe, surpassed only by Danish prices. Industrial power prices for Germany’s energy-intensive large companies are close to the European average and actually declined slightly in 2012 and 2013 owing to a reduction in wholesale power prices and wide-ranging exemptions granted these companies from levies for renewables and grid use. But from the perspective of export-oriented German companies competing in global markets, there remains considerable room for improvement. Average industrial prices in Germany, at roughly 9 ct/kWh, are roughly twice those in the U.S., for example. To date, Germany has fared well in terms of security of supply. Still benefiting from a historic surplus of conventional generation capacity, and with several new large, hard-coal plants due to come online in 2014 and 2015, the country should have adequate total firm-generation capacity until about 2018. Simultaneously, grid stability is high: in terms of overall system stability (including grids), Germany’s power-supply system continues to rank among the world’s most reliable. Average annual downtime (approximately 16 minutes in 2013) remains among the lowest in Europe and globally; the country’s reserve margin (that is, available generation capacity beyond the level necessary to meet normal peak demand) currently handily exceeds policy makers’ targeted 5 percent. Germany will be challenged, however, to deliver the grid extension necessary to bridge the often considerable distances between areas of high power generation from renewables (for example, northern Germany, which generates ample wind power) and the major consumption centers (notably, the industrial centers in southern Germany). In fact, extension of the transmission system could become the Achilles’ heel of the country’s energy transformation, driven by ongoing “not in my backyard”-type resistance from residents (which already appears likely to lead to the rerouting of at least one planned critical line) and exacerbated by the postponement of the commissioning dates of several key grid-extension projects. The German Power Sector: Quo Vadis? We know where Germany stands today. But where will it be tomorrow? Will the effort remain on track, and will the path be smooth or rocky? To attempt to answer these questions (in the face of the many obvious uncertainties), we have made what we consider reasonable projections for key indicators. Our analysis is based on proprietary, extensive modeling of the German electricity sector that we have used in numerous projects and as a basis for earlier publications2. We assume in our calculations that Germany adheres to its current policy; we also assume what we consider a realistic pace of technological development. For added perspective, we compare our findings with our projections for Germany’s likely results were the country to pursue a different course—the deployment of a fossil-fuel-based power system, one in which the share of renewable-generation capacity is held constant at 2012 levels, the country adheres to its current timetable for the phasing out of nuclear capacity, and retired nuclear capacity is replaced by gas-fired capacity. Again, we view outcomes through the lenses of sustainability, affordability, and security of supply. Our analysis is based to a significant degree on work conducted by BCG with and for the German Industry Association in 2012. Germany’s aggressive buildup of renewable-generation capacity will continue. Yet the country will struggle to meet its emissions targets. A Strong Buildup of Renewables. The country’s planned buildup of renewables in the coming years is indeed massive. We project that capacities for solar-PV and wind, which stood at 29 gigawatts (GW) and 31 GW, respectively, in 2012, will more than double by 2030. There has been concern within the country about the speed of the buildup, however, and it is noteworthy that the government’s policy update of 2013 and 2014 established limits to prevent runaway growth of renewable capacity. The government effectively set a cap on new construction of onshore wind capacity of 2.5 gigawatts per annum (GW/a), for example, and attempted to lower the cost of subsidies by reducing feed-in tariffs by up to 20 percent for sites with strong wind conditions. Similarly, the government roughly halved targets for offshore wind capacity, to 6 GW in 2020 and 15 GW in 2030, which we consider more realistic rates of expansion given the challenges of grid connection. The government also signaled a target of 100 megawatts per annum (MW/a) for new construction of biogas and biomass assets and limited new construction to plants that use refuse and waste as feedstock. Further, to taper the cost of subsidies for solar-PV assets, the government confirmed a cap at 52 GW for the cumulative amount of capacity eligible for support by feed-in tariffs, reduced the annual target expansion limit from 3.5 GW to 2.5 GW, and declared that consumption of self-generated power from PV panels larger than 10 kW would be partly subject to the renewables levy3. The government also announced that it would consider a change in the pricing of grid use fees: fees might be based less on energy consumed (ct/kWh) and more on the power of the grid connection (ct/kW). This potential change reflects the shifting dynamic in Germany’s power system, with backup power becoming increasing valuable relative to the pure energy transmitted. Although these changes introduce some important corrections to Germany’s course, the government’s original draft policy update was, in fact, more ambitious, as it sought to reduce the rate of short-term increases in power prices. But the government was unable to convince Germany’s constituent states to agree to the necessary sizable reductions in feed-in tariffs and new-construction rates, the states’ main priority appearing to be the defense of their regional interests (in the north, wind; in the south, solar PV). Germany’s growing commitment to renewables has not reduced the country’s dependence on conventional generation, however. In fact, Germany essentially continues to build two power systems: a renewables-based one and, necessitated by the absence of an efficient, scalable, long-term energy-storage technology, a conventional system that can ensure energy supply during extended stretches of very limited wind or sunshine. (See Exhibit 3.) Consequently, the amount of (largely conventional) dispatchable capacity in Germany will remain roughly constant to 2030.
partly subject to the renewables levy. By the end of the decade, decentralized solar PV could be economically viable for homeowners irrespective of feed-in tariffs. In Germany, the business case for decentralized solar PV with a one-hour storage device will start to become viable in 2015, assuming “own” power consumption is not subject to the renewables levy. Solar PV with storage could be viable from 2019 and beyond, regardless of whether own consumption is subject to the levy. Note, however, that these business cases are dependent on other regulatory variables, such as usage-driven grid-access fees. All told, we expect Germany’s total generation capacity to rise by 50 to 60 percent, reaching more than 250 GW, by 2030. Assuming stagnating net power demand in the years leading up to 2030 (which we consider reasonably likely), Germany’s maximal power-generation capacity—on sunny and windy days—in 2030 will exceed peak demand (roughly 85 GW) by a factor of three! This is a massive surplus for a market that was supposed to be liberalized and guided by the law of supply and demand. Simultaneously, Growing CO2 Emissions. We calculate that if Germany stays on its current policy path, it will overshoot its 2025 and 2035 targets for renewable energy’s role in the generation scheme: renewables will account for 45 to 50 percent of consumption in 2025 (versus a target of 40 to 45 percent) and for 65 to 70 percent in 2035 (versus a target of 55 to 60 percent). Germany will not, however, have equal success in reducing its CO2 emissions. We estimate that, in 2020, Germany’s emissions will be 35 percent lower than 1990 levels, falling short of the targeted 40 percent4 (which will be achieved by around 2025). This illustrates a striking dilemma facing Germany: given low carbon prices (both now and in the foreseeable future), the interconnectedness of Europe’s markets, and Germany’s phaseout of nuclear energy, the country’s buildup of renewables is hardly helping to reduce carbon emissions. Rather, it has translated into unabated use of coal-fired generation, partially for export of power. Essentially, Germany’s carbon-intense lignite plants are pumping cheap power into European markets—and greenhouse gases into the air. Finding a solution is problematic. Raising prices for CO2 allowances is far from a straightforward task, as is illustrated by ongoing contentious discussions among stakeholders and by the recent debate on “backloading” (a scheme for supporting carbon prices by temporarily extracting allowances from the market). Pushing for higher carbon prices is not necessarily in the interests of the German government, either (barring at least some global support for such a scheme), given the likely negative impact on German industry. And carbon prices would have to rise materially to have the desired effect. We calculate that, to trigger a switch from coal plants to new gas plants in Germany’s power merit order, carbon prices would have to rise to roughly €25 per ton; for older gas plants, they would have to rise to about €55 per ton. These levels are far from the current carbon price of about €5 per ton and the level of roughly €10 per ton that could result from the backloading plan. The notion of abandoning the pursuit of a single European power market—and turning back the clock on cross-country trading and the export and import of power—for the purpose of stopping Germany from exporting cheap power to its neighbors is currently hard for many to imagine and would contradict basic European economic principles, such as that of free trade. (It is noteworthy that Poland has started to introduce phase shifters at the border it shares with Germany to protect itself from uncontrolled German power exports during times of strong winds.) These realities have started the first-ever discussions within Germany of a carbon tax, emissions limits, and other mechanisms. Whether or not Germany can ultimately reach its long-term target for carbon emissions (an 80 percent reduction in 2050 from 1990 levels) will strongly depend on carbon prices and on the policies that the government institutes for sectors beyond power generation—which, in turn, will depend on international actions on climate change taken after 2020. So far, the government has not updated its policies for those sectors. If we assume, however, that Germany’s current policies remain in place—and that carbon prices rise to €74 per ton, a level in line with previous government assumptions of the economic damage associated with carbon emissions—we calculate that Germany could achieve a reduction of 70 to 80 percent by 2050. This assumes that policies defined in the 2010 <em>Energiewende</em> for nonpower sectors remain in place. Updated policies, especially for the heat, transportation, and industry sectors, are currently being defined by the German government. The costs necessary to implement the Energiewende remain substantial. The country will have to invest more than €400 billion in its power sector before 2033. Simultaneously, German industry and residential users will have to endure ongoing high power prices. Renewables Become Cost Competitive. By the early 2020s, the levelized cost of energy (LCOE) for many renewables should be competitive with those of coal and gas plants in Germany. (See Exhibit 4.) There are several points worth noting, however. First, the critical feature that conventional, dispatchable plants bring to Germany’s power system—controllable availability, driven by demand—is not reflected in this comparison. (By virtue of the power system’s current market design, the necessary backup to support renewables is provided “free” rather than charged to renewable providers.) Second, for fossil-fuel-based technologies, the real cost per kilowatt hour rises significantly when only dispatched hours are considered, since these plants are serving increasingly as backup capacity. Last, and most important, neither renewable nor conventional technologies will earn their new-construction costs at today’s (and tomorrow’s) price levels in the wholesale power market—meaning that prices will remain too low to trigger new construction of any technology. This suggests that a fundamental rethinking of the power market’s design is in order. We discuss this later in the report. Massive Investment Required. Taking into account generation, storage, and grid costs, the Energiewende will demand an investment of about €410 billion in Germany’s power sector from 2010 through 2033, €70 billion of which had already been made by the end of 2013. Part of the investment devoted to conventional power generation will be focused on making those plants more flexible—flexibility will be essential as these plants shift from providing baseload power to acting as “peaker” plants that are called on only during times of peak demand. (It is worth noting that Germany’s new conventional power plants, which will be optimized for flexibility rather than efficiency, will likely have lower investment costs per kilowatt of capacity than their predecessors.) Had the original 2010 plan remained unmodified, the cost would have been higher: the slowdown in the expansion of offshore wind capacity and related grid extension mandated by the policy update of 2013 and 2014 reduced the required investment by around €60 billion. Our comparison assumes a moderate increase in fuel prices but a carbon price of roughly €40 per ton—both in line with earlier assumptions made by the government as well as by Germany’s transmission-system operators in their Netzentwicklungsplan, or grid development plan5. A change in carbon prices would affect the numbers materially. Were today’s carbon prices (approximately €5 per ton) to prevail in 2033, the cost difference between the two systems would be 50 percent. At about €70 per ton—a figure considered by German government representatives to be the “true” economic cost of carbon emissions—the two systems would cost the same. The government’s policy update of 2013 and 2014, undertaken with the main objective of limiting cost increases, did indeed reduce system costs compared with those associated with the 2010 plan. But the reduction is a mere 1 ct/kWh in 2033. Power Prices Remain High. Barring a significant change in carbon prices, Germany’s wholesale power prices will be essentially stagnant in the years ahead. (See Exhibit 6.) Our scenario analysis indicates that, assuming a carbon price of €5 per ton, there will be little change in wholesale prices in the near term (prices will hover around 3.0 to 3.5 ct/kWh), as the buildup of renewable capacity continues and the current overcapacity of conventional resources is reduced. Prices will rise in the medium term, as the remaining nuclear capacity is phased out, and then fall slightly in the long term. Clearly, wholesale prices will remain highly sensitive to carbon prices. Our analysis suggests that residential power prices will likely remain high. Germany’s prices have soared in recent years, with prices now second only to those of Denmark among the European countries. Much of this rise has been driven by the renewables levy—price increases were particularly strong between 2010 and 2013, when large amounts of solar-PV and wind capacity were connected to the grid. In the future, growth in residential power prices should moderate. (See Exhibit 7.) Assuming today’s pricing mechanisms, our simulations show a rise in real terms of about 1 percent per year over the next ten years, following annual growth of 5 percent over the past decade. Prices in 2023 may therefore be 10 to 20 percent higher than those in 2013. (See Exhibit 8.) Note that this calculation includes all applicable taxes and levies, including a “security of supply component” (hidden today in grid use fees) used to finance the development of sufficient backup capacity to cover peak demand hours that lack sufficient feed-in from renewables. Ultimately, we expect the renewables levy, and with it residential power prices, to peak in the early 2020s, resulting from a combination of two factors. First, the subsidies for today’s new renewables are significantly lower than the subsidies for those 20, 15, or even 10 years ago. In 2004, renewable assets going online with peak power of less than 30 kW were awarded a feed-in tariff of 57 ct/kWh for a period of 20 years; by the summer of 2014, this tariff had fallen to 12 ct/kWh. Second, in the years leading up to 2023, many of these early, expensive renewable assets will have been in operation for more than 20 years and will no longer be eligible for tariff support. The policy update of 2013 and 2014 will have a modest impact on residential power prices in the medium term. Residential power prices in our simulations are 33 ct/kWh in 20236, compared with 34 ct/kWh under the unmodified 2010 plan. Industrial power prices will also continue to rise. But price increases for many large industrial companies will be more moderate than those facing small industry, business, and households because of the exemptions these large players have secured from the renewables levy, as discussed above. The precise arc of the price increases they face will be driven to a large extent by the price evolution of fossil fuels. These projections assume the avoidance of excessive costs from the uncontrolled growth of solar PV. The problem of uncontrolled PV growth was first addressed in a cap policy introduced in 2012. The only viable option for halting increases in power prices for households and small industry, or even lowering them, seems to be the use of state money. Under Germany’s Renewable Energies Act, the feed-in tariff for renewable technologies is guaranteed for 20 years (12 years in the case of offshore wind). Consequently, the country’s commitment—the largest component of which relates to the roughly 25 GW of solar-PV capacity installed from 2009 through 2012—is essentially locked in for the medium term. Shortening the 20-year guarantee would be difficult, if not impossible, owing to both the legal hurdles and the political ramifications: a large cohort within the middle-class electorate benefits from generous feed-in tariffs for the solar-PV panels on the roofs of their homes. Hence, a lowering of the power tax or other types of relief funded by public budgets seems the only means of limiting power-price increases or possibly even achieving a reduction. Gradually eliminating the 2.05 ct/kWh power tax could, for example, stop a further increase in power prices in the short term. Ensuring a sufficient supply of power while pursuing the Energiewende, and doing so in a cost-efficient manner, will present major challenges to Germany. Two of the most critical will be maintaining sufficient backup capacity—a challenge compounded by ongoing uncertainty regarding market design—and advancing grid extension. How Germany chooses to tackle these challenges will have implications that extend beyond its borders. Ensuring Sufficient Backup Capacity. With their output increasingly crowded out by renewable generation, and suffering from the effects of declining wholesale power prices, Germany’s gas power plants and many of its hard-coal plants have become unviable. In fact, we estimate that more than half of Germany’s conventional plants were cash flow negative in 2013. As a result, a significant number of plant shutdowns7 are planned: between December 2012 and May 2014, companies announced that approximately 7.7 GW of capacity, or roughly 8 percent of Germany’s total installed conventional capacity in 2012, would be taken offline. Concerned about the systemic effects on the power system were such plant closures to persist, Germany’s government introduced so-called grid reserve (Netzreserve) regulation in the summer of 2013. This requires plant operators seeking to shut down a plant to secure regulatory permission. For plants deemed “system critical,” operators would be denied permission to close but would receive remuneration (financed by an increase in the grid use fees charged by transport system operators) for the plants’ fixed costs. By May 2014, 1.4 GW of plant capacity fell into this category. (One of the plants receiving such subsidized payment is Irsching 5, the world’s most efficient combined-cycle gas power plant, which has been in operation only since 2010.) We expect that this trend will continue: overcapacity of conventional generation will shrink over time, while plants deemed essential8 will be kept alive through bilateral payments under grid reserve regulation. Germany’s conventional power supply is generally believed to be secure until roughly 2018, but clearly this security depends on both the continued enforcement of grid reserve regulation and the successful implementation of key grid-extension projects. The potential for new regulation related to carbon emissions is another factor that could affect the availability of coal plants specifically. Uncertainty Regarding Market Design in the Medium Term. The challenge of ensuring sufficient backup capacity is compounded by ongoing uncertainty regarding market design. Policy makers acknowledged in their policy update of 2013 and 2014 that the power market’s design needs to be fixed. But they were vague about how this might be done. They announced the planned development of a broad, technology-independent capacity mechanism “in the midterm,” as well as further development of grid reserve regulation. They volunteered little else. We believe that the introduction of a broad capacity mechanism is unlikely within the next several years (that is, before roughly 2018) for a number of reasons. First, assuming that current capacity can be maintained by regulation, there seems to be no fundamental need for substantial new capacity except in critical locations where nuclear plants are scheduled to go offline. Second, grid reserve regulation already allows for selected construction of new power plants through tenders or, should the need arise, direct construction by transmission system operators. Third, policy makers will be reluctant to incur explicit additional costs and introduce subsidies, given the public’s sensitivity to measures that could be construed as beneficial to Germany’s utilities. Advancing Grid Extension. Grid extension is a second critical enabler of the Energiewende . Large-scale extension will be necessary, as noted, especially for the transmission of wind-generated power from Germany’s northern coastline to industrial centers in the south. It will also be necessary for the local integration of solar PV and wind power. German transmission-system operators estimate that meeting Germany’s power-transmission needs will require approximately 3,500 kilometers of new construction in new corridors and the enhancement of about 5,000 kilometers of transmission capabilities along existing routes. So far, progress on grid extension has been limited. By the end of 2013, only 15 percent of planned priority projects had been completed. And the expected commissioning dates of 40 percent of reported projects had been postponed—this despite the passage of laws to increase the speed of planning and permission procedures. The critical challenge that policy makers face in advancing grid extension is overcoming local resistance among communities and even among senior municipal and state-level policy makers. The challenge is a thorny one. Indeed, as Germany approaches the 2022 deadline for the final phaseout of nuclear energy, grid extension could well become the biggest hurdle for the country’s energy transformation. A Destabilizing Impact on European Power Markets. Germany’s reshaping of its power system will have ongoing significant ramifications for the power markets of other European countries, given the interconnectedness of these markets and Germany’s status as a heavy exporter of power. Consider some of the effects already evident. Surging supplies of electricity from German renewables have driven down regional wholesale prices, weighing on the finances of power plants in neighboring countries. Midday spikes in output from Germany’s solar plants have reduced the prices that pumped-hydroelectric storage plants can command for electricity during those (formerly high-profit) hours; this “peak shaving” has rendered these plants unprofitable. As a result of German exports, generation capacity is now in oversupply in a number of countries, most notably Austria; ironically, German transmission-system operators have contracted with (old) Austrian plants to provide backup power. The situation is causing some countries to rethink the merits of a renewables-centric approach to power generation, and the region’s path forward is uncertain. Poland, for example, remains heavily reliant on hard coal and plans to develop a nuclear program; France continues to rely heavily on nuclear generation. How these divergent views and approaches will affect the European Union’s policy targets beyond 2020 remains to be seen. At a minimum, countries will likely have to align on carbon-emissions targets, which could be problematic. Hence, the Energiewende alone will not free Germany from its reliance on Russian gas. Instead, the country will need to consider alternatives, such as importing liquefied natural gas from Qatar or, potentially, North America. The list of announced plant closings even includes a nuclear plant, Grafenrheinfeld, located in southern Germany. The plant’s operator, E.ON, announced in March 2014 that the plant would be shut down earlier than the country’s nuclear phaseout schedule mandated (in spring 2014 rather than at the end of the year). E.ON said that continued operation of the plant would have been economically unviable because of a certain fuel-rod tax. Priority will be given to maintaining sufficient capacity in southern Germany. The region is home to a large number of nuclear plants and thus stands to be significantly affected by the nuclear phaseout. The region also has strong power demand from industry. And there is a shortage of grid connectivity between the north (where much of Germany’s wind capacity is located) and the south. Re-regulation: The End of Liberalization? Germany’s pursuit of the Energiewende poses fundamental challenges to incumbent utilities—and is triggering a systemic crisis in the power sector. This will likely spur government intervention and lead to a restructuring of the industry. It may also spell the end of power market liberalization in Germany and possibly beyond. Germany’s incumbent utilities—big and small, publicly and privately owned—continue to experience a severe disruption of their business model. That model—tailored to a world of large-scale assets, large capital expenditures, long investment cycles, and high barriers to market entry—is increasingly ill suited to an energy landscape evolving toward small- and medium-size assets, shorter lead times, and the lower barriers to entry implied by decentralized generation technologies, such as wind farms, rooftop solar-PV panels, and micro combined heat and power systems. This basic challenge has been greatly exacerbated by regulatory action and subsidy-driven distortions. Incumbent utilities are thus under severe pressure. Their power-generation business is suffering from the effects of the phaseout of nuclear energy and an unviable business model for their hard-coal and gas power plants. Their retail sales face the risk of declining volumes as “pro-sumers” both generate and consume their own power and sell the surplus back to the grid. Their margins in energy trading, especially in forward markets, are under increasing pressure. Utilities have divested a significant percentage of their grid assets because of regulatory pressure to unbundle energy assets and—partly—the belief that return-regulated businesses are unattractive. And utilities’ share of ownership of (increasingly prevalent) renewable assets remains small. In 2012, utilities owned only 12 percent of installed capacity of onshore wind and solar-PV assets (up from 6 percent in 2010); the rest was owned by private individuals, farmers, banks, project developers, and other parties. Not surprisingly, Germany’s utilities have lost a considerable amount of shareholder value in recent years. While the German DAX index has returned to pre-financial crisis levels, utilities continue to languish, with share prices at the end of July 2014 for EnBW, E.ON, and RWE standing 55 to 70 percent lower than early-2008 levels. Shares of other European utilities, including EDF, GDF Suez, Iberdrola, and Enel, are suffering as well. A significant commonality between the two situations is their broad scope and the specter of collateral damage. The banking crisis was felt worldwide, with its direct and peripheral effects (including credit shortages, falling asset prices, and job losses) spanning many industries and segments of society. A power sector crisis in Germany would be felt acutely both within the country’s borders—German industry and residents could, for example, face even steeper increases in power prices and an elevated risk of large-scale blackouts—and across Europe. A second commonality is the “system relevance” of individual actors: the collapse of a major player, as in the financial crisis, in Germany’s power landscape could have systemic effects on the country’s overall power supply (although, fortunately, a power plant will not immediately disappear if its owner becomes insolvent). A major difference between the two crises is their respective causes. The global financial crisis was driven to a large extent by risk taking—in particular, by excessive investment in U.S. subprime mortgage-backed securities—by private-sector institutions. Germany’s pending power-sector crisis, in contrast, is being driven by deliberate political decisions and the resulting introduction of subsidies and regulation. 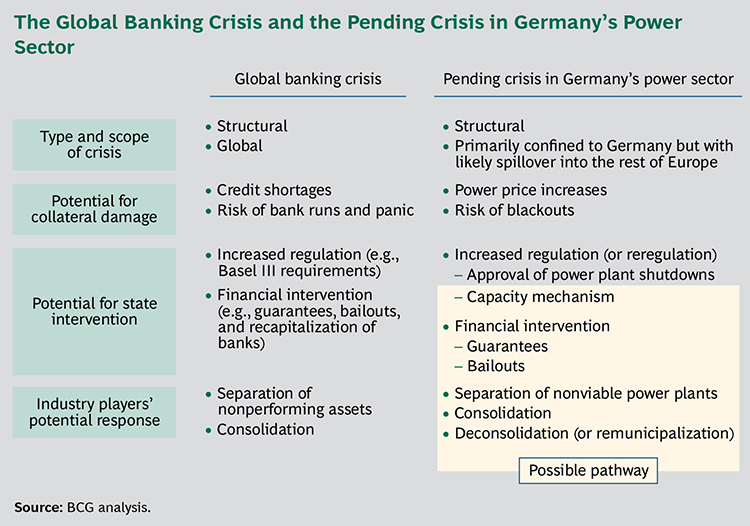 Hence, the banking crisis is perceived by many to have been the fault of the banks themselves, which is not the case for Germany’s troubled power generators. An array of measures will likely be necessary. Governments took a broad assortment of actions to stanch the financial crisis. These included actions that had an immediate financial impact, such as the nationalization of banks, as well as measures that had an indirect or a deferred impact on state budgets, such as regulatory changes and financial guarantees. The European Commission’s powers could increase significantly. The EC’s role in stemming the financial crisis in Europe grew considerably as the crisis progressed. (To a degree, of course, the EC’s expansive role was inevitable, given that the common currency automatically made the crisis regional in scope.) The EC assumed responsibility for approving state aid for troubled banks, for example, a role that rapidly increased in importance as the crisis unfolded and major national banks needed state assistance. Over time, the EC defined (increasingly) sophisticated criteria that had to be met concerning the effects on competition within the industry and the sustainability of the business models of rescued entities. Gaining public approval is critical. The banking crisis and its resolution revealed that winning a certain amount of public acceptance for proposed state aid to market participants is vital. Before the onset of the financial crisis, there was already widespread antipathy toward the financial sector for its perceived excesses and greed; this made the task of getting the public’s blessing for subsequent bailouts challenging, although policy makers ultimately overcame this by citing a “lack of alternatives.” German policy makers may face similar challenges in winning public approval for aid to utilities, some of which are viewed by much of the German population as the driving force behind rising power prices and as “dinosaurs” for their slow acceptance of the need to transition away from conventional generation and toward renewable sources. Extension of Regulatory Approval for Plant Shutdowns Beyond 2017. As discussed earlier, the permanent shutdown of any conventional power plant requires regulatory approval. If approval is denied, the plant owner is reimbursed for its fixed costs. Such regulation, instituted in July 2013, is scheduled to remain in place through the end of 2017 and could be extended. Selective Auctioning of New Plants. The government would selectively—in specific regions, for example—auction the right to build new plants that are deemed crucial for the security of the power supply. Remuneration would be regulated: owners could be guaranteed a fixed return on investment, for example, or compensated based on the relative efficiency of their operations. Current grid-reserve regulation already permits plant auctioning and regulated compensation as a means of reimbursement. Development of a Capacity Mechanism. Capacity payments, determined by a capacity mechanism, would complement the energy-only market by offering payments for providing (backup) capacity. Different types of mechanisms are possible―major design parameters include differentiation by technology and region. Centralized Dispatch of Power Accompanied by Regulated Remuneration. An independent system operator could dispatch power based on the merit order. As with the selective auctioning of plants, remuneration would be regulated. Orderly Liquidation of Distressed Utilities. Utilities that run into financial difficulty could be liquidated or have their assets stripped. Nationalization, municipalization, or acquisition of such plants by other utilities are possibilities. Rescue of Distressed Utilities. As an alternative to liquidation, the state could guarantee refinancing or equity bailouts for troubled utilities. This would likely result in financial obligations for rescued players but would leave company structures intact. State-Orchestrated Consolidation of Fossil-Fuel-Based and Nuclear Plants. The fossil-fuel-based or nuclear assets of utilities would be bundled into a dedicated entity; utilities would receive shares of that entity in return. (Germany’s consolidated coal company RAG, which bundled its non-coal-related assets into a separate entity in 2007, could serve as a model.) The government, operating at the federal or state level (North Rhine–Westphalia, for instance), would moderate the process and possibly provide guarantees. The government could, for example, create a national corporation that owns and operates all hard-coal plants, an idea proposed by the trade union IG Bergbau, Chemie, Energie. Each of these eight options would need to be weighed against Germany’s key goals. Policy makers continue to confirm that security of supply is of critical importance; the banking crisis suggests that system efficiency and the viability of any business model introduced by intervention should also be high-priority objectives. Clearly, none of the eight options alone would meet all of Germany’s goals, and each would face severe hurdles to implementation. None of the proposed changes in ownership structure, for example, would do anything to ensure sufficient new capacity to replace decommissioned plants; for that, some form of regulatory change will be necessary. Thus, as was the case with government intervention in the banking crisis, German policy makers will likely need to employ a combination of measures. We believe that a capacity mechanism and centralized dispatch are among the most broadly potent levers and should be part of whatever course the government chooses. But the government will be constrained in its choices by public and legal hurdles, at least to a degree. A direct rescue of distressed utilities, for example, would meet both public resistance and legal challenges from European regulators. The same holds for a potential (re-)formation of an integrated power group or groups, with both the public and European officials likely to push back on the prospect of “monopolies.” Instead, system-relevant plants will likely have to be saved at the individual-asset level by means of grid reserve regulation (options 1 and 2, above), a consolidation of plants orchestrated by the state (option 7), or simply a sale to owners who have lower expectations for returns on capital. Regardless of what course of action the German government takes, it seems likely that the country’s power industry faces a serious restructuring, one that could include changes of ownership, shakeouts, and national or cross-border consolidation. And the specter of additional state intervention will remain. This triggers a fundamental question: Will we see the end of power market liberalization, a key pillar of German and European policy making, in Germany—and, potentially, beyond? Does this signal the end of power market liberalization as we know it in Germany (and, potentially, across Europe), 20 years after the start of Europe’s liberalization campaign? It seems likely. It is hard to imagine that someone will magically produce an efficient market design that addresses the current German market’s inadequacies and allows for both full competition and actualization of the country’s many other, Energiewende-related objectives. The simultaneous pursuit of increased power generation from renewables; decarbonization; security of supply; affordability; phaseout of nuclear energy; competition; and market liberalization, to name just the key ambitions of German policy makers, may simply be too ambitious (if not overdetermined) for a liberalized market. The question then becomes, Which of Germany’s objectives will remain, and which will be (explicitly or implicitly) abandoned? Given the acknowledged importance of security of supply, and the lessons learned from the California power crisis of 2000 and 2001 and other power-market crises, competition and liberalization may well be relegated by German policy makers to a lower priority. So we may well see the curtain drawn on deregulation and liberalization and the start of a new wave of power market regulation. In Germany and possibly beyond, the role of the merit order could be reduced to that of a dispatching tool. Large-scale power generation could revert to a return-regulated business (as renewable generation and the grid are today). As part of so-called capacity markets, tenders, power purchase agreements, and similar mechanisms might well see a revival. Ultimately, we believe that German policy makers will be forced to acknowledge, as they consider the Energiewende’s various objectives, that there is no way to deliver simultaneously and equally well on sustainability, affordability, and security of supply, at least in the medium term, and that trade-offs will have to be made to ensure sufficient progress on each front. Below are considerations for policy makers as they attempt to strike a balance. Despite Germany’s ongoing buildup of renewables, emissions reduction remains elusive. The country has several options to try to remedy this, but none is particularly promising or appetizing. Germany could, for example, exert its influence to try to raise carbon prices. But it would take a significantly higher carbon price—roughly €25 to €55 per ton versus today’s €5 per ton—to drive a switch from carbon-intense coal to gas in Germany’s merit order, and this does not seem likely in the foreseeable future. (A price increase below those levels would raise current wholesale power prices but would not have a meaningful impact on carbon emissions in power generation.) Germany could also introduce a national carbon tax but, if applied broadly to German industry, such a tax could imperil industry’s international competitiveness. Other potential measures to foster emissions reduction have their own stumbling blocks. Germany could introduce emissions standards for power plants—setting a limit on the number of grams of CO2 emissions allowed per kilowatt hour produced, for example, or on the total tonnage of emissions per year per megawatt installed. Doing this would indeed lead to the intended reductions in output from power plants. But it might also speed the need for additional new conventional capacity and lead to further increases in power prices. Germany could also limit power exports, which would reduce conventional plants’ load and thereby their emissions. But this would contradict the principle of a single European power market and raise Germany’s costs further by increasing the need to subsidize idle backup capacity. Finally, Germany could extend the lifetime of nuclear power plants—but this would be a nonstarter politically, given that the German public sees the phaseout of nuclear energy as a higher priority than emissions reduction. None of these options is particularly appealing, obviously. Hence the challenge of driving down emissions will remain problematic. Affordability: Tax Relief for Power Prices? As discussed earlier, we believe that the most viable means of limiting increases in power prices is government budgets. To gain the necessary public approval, the government must position emissions reduction and increased energy independence as public services (comparable to national defense or highway infrastructure, for example) that must be paid for by the public, not just by the power sector. Stabilization of residential power prices should not be driven by additional subsidies but rather by tax relief, such as a reduction of the current 2.05 ct/kWh power tax to the EU minimum rate of 0.1 ct/kWh for private households. Were this measure implemented, the increase in residential power prices from 2013 to 2023 would be 5 to 10 percent, compared with the 10 to 20 percent increase likely without tax relief9. Other ways to lower households’ power costs could be to reduce the power tax to the minimum rate only for the first 1,000 kWh that each household consumes (thereby maintaining the initially intended steering impact of the tax) or to reduce the value-added tax on power from its current 19 percent to the 7 percent rate applied to food and other basic goods. To ensure that industrial power prices remain at levels that do not compromise German industry’s competitiveness or ability to invest, the government should commit to holding industry’s current exemptions from levies and taxes at roughly their current levels. Implementing these measures would add €3 billion to the federal budget—roughly 1 percent of Germany’s 2014 budget. Policy makers should keep three things in mind. First, pursued simultaneously, the phaseout of nuclear energy and an increased emphasis on renewable generation could spell the de facto end of power market liberalization in Germany and likely beyond. Second, as noted, if Germany continues on its current path, the energy-only market will no longer send the price signals necessary to drive investment, and the merit order will be relegated to serving primarily as a dispatching tool. Steps will need to be taken (for example, the reinstitution of power purchase agreements and similar mechanisms) to address capacity directly. Third, the longer the country delays in completing the necessary grid extension, the greater the need in certain regions for mechanisms that spur the construction of new power plants. We expect Germany to maintain its commitment to a full withdrawal from nuclear energy. We also expect the country to do its best to adhere to its emissions-reduction aims, the many challenges notwithstanding. It is likely, however, that policy makers’ calculus here will be influenced by developments abroad. Over the past several years, international support for emissions reduction has been far from uniform. On the contrary, a number of countries, including Australia, the UK, and Spain, have actively turned away from their abatement ambitions. Should this trend continue, the real-world costs to Germany of pursuing its existing targets, especially those related to reduced industrial competitiveness, would rise further, potentially to levels that cause public commitment to waver. If, on the other hand, there were an international revival of abatement ambitions, Germany’s perceived and real burden would ease, and the country’s resolve would likely be strengthened. Recent proposed policy initiatives and statements from both the U.S. and China suggest that such a revival is possible. Indeed, we see the potential for a quite strong global refocusing on climate change after 2020. Can, or will, Germany stay the course until then? All things considered, we believe it is possible, if not likely, that Germany will choose to postpone (or will simply miss) some of its emissions targets. We would encourage the country to remain steadfast to its overarching commitment to climate protection and sustainability, however, despite the tremendous challenges to individual players and to Germany’s power system and economy. The authors would like to thank Christophe Brognaux, Matthias Herrmann, Dieter Heuskel, Moritz Paulus, and Andreas Wagner for their contributions to this report.